The curvature of the lobby bar is a classic "Catskills Modern" architectural feature. When the lobby was built out in the 1950s, modern architecture was all the rage. This lobby's original design used curves without remorse, but unfortunately, soulless renovations in the 1990s and fire code changes led to many of these modern elements being removed entirely or made much less obvious. 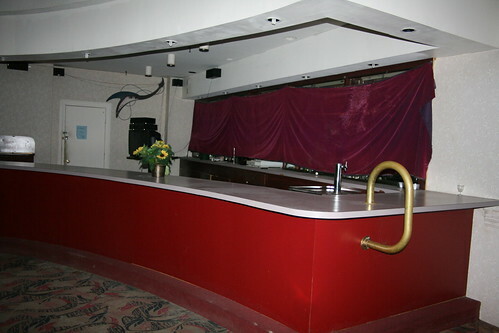 However, the curved lobby bar stands as a testament to the original design. Also, compact fluorescent light bulbs poke out of the high hat lights in the ceiling.